DEARBORN — The Dearborn-based 3D printer manufacturer EnvisionTec announced what it called an entry-level industrial-grade 3D printer, the Aria. Launched in November and now priced at $5,999 for North American customers, the Aria is a Digital Light Processing printer that uses an HD projector to deliver high-quality surface finish and accuracy. 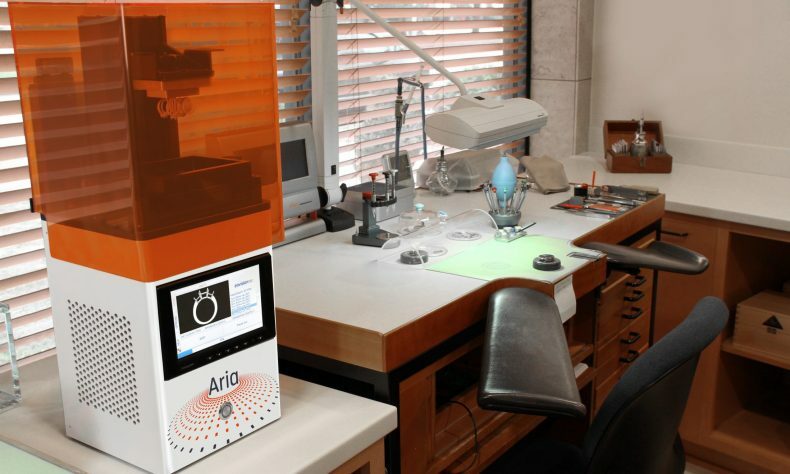 The Aria is intended for jewelry makers, professional designers and engineers. The Aria is available for purchase online at www.EnvisionTEC.com/aria, with an estimated delivery date of 4-6 weeks from purchase. Shipping is currently limited to customers in North America and Europe. Aria features an industrial-grade UV LED light engine, a dual-axis Z slide and a material tray built with optical glass instead of plastic. Z layer resolution can be set at 25, 35 or 50 microns, depending on material. Aria also comes equipped with EnvisionTEC’s #15YearsBetter firmware and software, which offers patented grayscaling and exposure strategy techniques. * EC500 — The highest resolution and crispest lost wax casting material available without sacrificing speed. Ideal for heavier jewelry pieces. * PIC100 ― Produces castable parts with exceptional detail, including thin walls and intricate features. Three times harder than carving wax and ideal for delicate jewelry. * QView ― For quick design verification, QView is one of the fastest printing materials offered by EnvisionTEC. * RC90 ― A high heat-resistant material containing ceramic for building tough, stiff parts in a resolution many regard as the best in 3D printing today. Ideal for building parts to create rubber mold masters, RC90, is used by some of the world’s leading technology, entertainment and jewelry manufacturers. Founded in 2002, EnvisionTec sells a variety of printer configurations based on six distinct technologies that build objects from digital design files. The company’s premium 3D printers serve a variety of medical, professional and industrial markets. EnvisionTEC’s intellectual property includes more than 140 pending and granted patents. Learn more at EnvisionTEC.com.